Africa Gathering: Festival of Technologies: Start it! Build it! Angelique Kidjo is one of Africa’s most celebrated and internationally renowned musical exponents. When Kidjo, who was listed by the UK Guardian, as one of the most Inspirational Women in the world is not recording or touring, she is busy travelling the world as a UNICEF Goodwill Ambassador, engaging with local communities about the need for change and equality for all. An activist who has spoken on subjects many would shy away from – from HIV/Aids to gay rights – Kidjo is also a strong advocate for the education of women. The Batonga Foundation, which provides educational aid to young African girls, is testament to her passion. Belinda: How would you describe the current state and positioning of the African woman politically and economically? Angelique Kidjo: It has improved a lot and this is due to two things: The focus on educating girls and when the trend of micro-finance/credit started, it brings to light that women in Africa are really the mortal and backbone of the African economy because when you give a loan to a woman, the women will 99 percent of the time, pay it back. Therefore, it brings the attention to the fact that if we can empower African women, we can surely and quickly develop our countries, better than just seeing a woman as a housewife. It’s also the fact that on the continent today, we have the first African female president and that has played a big role in the way that people perceive African women. That said, it’s still not completely perfect because we still have a lot of work to do and the one thing that’s really hard to change is mentality. I always say I love a lot of our tradition but some of them are not good and we have to have the courage to face it and do everything in our capacity and collectively to ban them from our society. It means that we need civil societies on the ground, doing the work by ourselves not other people telling us what and how to do it, and hold our leaders accountable. How do we do that? By educating people and letting people speak up for themselves. Belinda: You are a passionate advocate when it comes to the education of the African girl child. What impact did education have on your life and why is it important to you for girls to be educated? 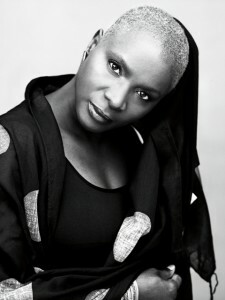 Angelique Kidjo: Everything! The thing that made a huge difference in my life is that my parents would not let me walk away with nonsense. My father made it clear – “you want to sing, fine, I will support you till you can do it by yourself but on one condition that is neither discussable nor negotiable, you have to go to school and have a degree. God forbid, something happens, you have to be able to be independent and work.” My father used to say because you are a singer doesn’t mean you don’t have a brain and can’t discuss everything that comes your way. Read, be curious and ask questions. If I don’t have the answers, I will go and get the answers for you. But you cannot be an artist and not be able to talk about your art or other people’s art and culture. That’s not going to happen under my roof. Everything I accomplished today started in my childhood. Belinda: We have witnessed in recent times, women speaking out, from Egypt to Nigeria, when there have been cases of violence against women. Do you think African women have finally found their voice? Angelique Kidjo: Violence against women is not an African issue. It’s a global issue. How do we bring back that topic into our society? We the women, we raise the boys. When your young boy starts beating his sister and you sit quietly and watch, you are planting the seeds of violence. If we, African mothers don’t raise our boys, telling them its okay for them to wash your clothes, go to the market and cook; or that it’s okay for you to cry because you are a human being first, and you can express your feeling and that showing your feelings does not mean you are less of a man, that’s where it starts. My mum raised my brothers the way I have just explained and my father’s family were against the fact that she was teaching my brothers how to sew, cook, clean the room and do the dishes. My mum’s answer to them was “no woman is born to be the slave of a man. When you marry someone, it’s a partnership. You are not an object, you are not merchandise.” The stigma that we create generation after generation leads us to this violence. If we want to stop violence against women, we women have to start raising our boys the right way. It does not matter where we grow up, what language we speak and it does not matter what skin colour we have, we have to start at home. A father cannot beat the mother in front of the boys and think the boys won’t repeat the same thing. The father is the example that the men will follow. Belinda: You are a UNICEF ambassador and travel to different places. What are some of the taboos, women in Africa still have to deal with and how can we corporately ensure the next generation of young African women do not encounter the same problems? Angelique Kidjo: Education. And that is why so many countries don’t want to do it. It’s a political issue, especially the area I’m working in, secondary education. It’s more difficult because you are dealing with teenagers, who are at the age, where the father can come and drag them out of school and get them married or male teachers or men in general see them as potential wives and get them pregnant. The problem we have is poverty. Those kids are facing enormous pressure because the family has no money. When somebody that has a little bit of money is luring you with his money, what do you do? You want the best for your family. So you give yourself up for that man and before you know it, the guy is gone because all he wanted was to get under your underwear. We have to educate the boys the same way. Examples speak more than words and the men we have today that are not going to school, how do we get them onboard? The stigma goes both ways and we blame African men but there are good men among them. Let’s find and campaign with them because when you are a woman just doing it, they call you feminist, and they don’t respect or give attention to what you say. How do we change the society? By teaming up with men who can help us carry this message because there is no salvation for men without women and no salvation for women without men. We have to work together. Belinda: In equal measure, how do we keep that momentum going politically, economically and with education is concerned, so we do not slip long the way? Angelique Kido: I know the life we live abroad is a hectic and a stressful one. I juggle so many things but the thing is, we have one life, so if we wait to do things that we have to do, we lose our life. The momentum is lost when we all start we are not seeing progress and we give up. We can fall 10 times and the 11th time, might be the good one. You cannot give up because if we give up on the people we are trying to help, they will not stand up for themselves. Your unwavering commitment is what gives the people the strength. Belinda: You were one of the artists at the Nobel Peace Prize ceremony, and sang Leymah Gbowee’s choice song. What did that day signify in the history of African women and for the continent, who have been instrumental in changing the course of a nation? Angelique Kido: We are changing and people are acknowledging the great work that we do in our society to keep it, at peace and to keep the foundation of our family. And the Nobel Peace Prize has proven to me that every work that we do, no matter how hard it is, we are on the right path. So, we can’t wave that commitment any time soon. Belinda: What’s the message that you would like to share with African women about who they are, recognising their rights as women and the right to be? Angelique Kidjo: First of all, what I have to say it is a pity that women have to have a day but there is no international day for men. Therefore, as human beings, before being a woman, my dream is to see that day disappear one day and we will be equal to men in our rights. What I have to say to African women, wherever they are and women in general, we can fight for our rights everyday but if we forget the role of women, as the nurturing part of society and the one that keeps the balance , then our fight will be worthless. I’m a feminist but I’m not willing to castrate men. Not all men are bad and my father, husband and father are examples I use all the time. I have wonderful men surrounding me and I know there are many more out there. We have to try and reach out to men that can help us make this world safer for our children. Angelique Kidjo’s first live album, Spirit Rising is now out and she is part of the BT River of Music Festival and the Africa Utopia festival at the Southbank Centre, London. Both festivals form part of the Cultural Olympiad for the London 2012 Games. Note: This article was first published in the New African Woman magazine, February-March, 2012 edition. This entry was posted on Wednesday, June 13th, 2012 at 11:10 pm	and is filed under Africa, African Diaspora, Gender, Interviews, Journalism, People, Women. You can follow any responses to this entry through the RSS 2.0 feed. You can leave a response, or trackback from your own site. So well said! Women have a huge role to play in the gender dynamics. Women bring up these “boys” that end up as abusers…Education of women is important, and this is beyond the classroom. This interview is educative, in that sense. That is definitely true. As women, we have to take responsibility for our role too. Society is not always a one-sided business. I´ve followed a lot about Africa lately and it feels good reading this excellent interview. You have the tools in your own hands.